Well, you Toolmongers identified the last tool we posted like this in less than a day. Look past the jump for add’l pics. Any ideas? Let us know in comments. More like a de-soldering gun, with the motor running a vacuum pump. Or alternatively some type of plastic welding or sealing tool. I was thinking that the motor was running the fan that was sucking the hot air away from the heating element in the assembly so that the main heating element got nice and hot without the gun itself getting too warm. but that made no sense at all. Alternatively, I don’t see a hole in the element for the desoldering, nor do i see a way to remove the removed solder. The barbs for air lines confuse me though. Is there a burr or bit nestled in the tip? I’d guess that the air fittings would be for blowing/sucking away the dust created by grinding or other activity. 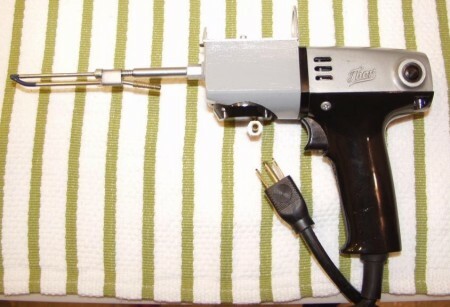 it is a soldering gun. My dad had one like that. 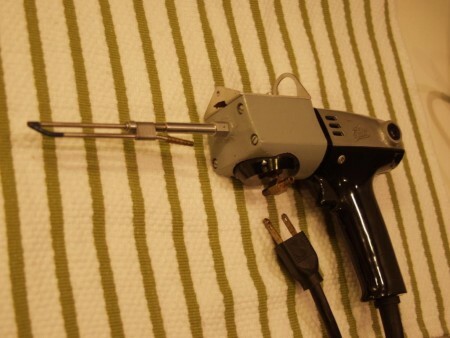 Nope, not a soldering gun. Its a tool used in old “Big Iron” mainframe computer days to delete printed circuit connections to a pin on a circuit board. Old IBM 370 days computers had multi-layer circuit boards/backplanes and this tool would allow you to cut a trace on the 1st or 2nd layer. After deleting the trace a wire would be wrapped on the pin then to another to fix or change the circuitry. There was a vacuum to keep debris from falling on other circuitry. Not a soldering gun. I’m betting there’s a mixing auger inside that nozzle, and that it’s for some kind of epoxy or other fluid dispensing system. Damn. I think Steve Keller has it cold. Wow, Steve! Sounds like you may have nailed it! Actually, it’s funny that you mention IBM because that’s where I work and it’s where I bought the tool… Rather than pay to have all of their old/obsolete equipment recycled, our IBM site holds a “junk sale” every Wednesday where their employees can go and buy stuff like this at yard sale prices (in addition to this tool, I picked up an oscilloscope a few weeks ago for $30!). Steve, now you’ve got me curious what the cutting tip looks like! I’d imagine it’s not totally unlike an unwrapping tool — a hollow sleeve with some sharpness around the perimeter, like an ultra-narrow hole saw. I would *love* to see a demonstration of how this thing works, a la http://www.circuittechctr.com/guides/guides.shtml for soldering. Is that a reciprocating hot knife? I just plugged the tool in again, and it’s very slight, but it feels like a vacuum is formed on the brass “T” fitting on the bottom of the unit when you pull the trigger. They finally had a oscilloscope at the surplus sale? Damn, I need to start going to it again. I stopped going when I got tired of looking at the same crap every week. Yep! They’ve had some pretty good stuff recently. You’re right though… For a while there, it was just the same old stuff every week. It is a hot knife. Pull the trigger and the blade on the end heats up, letting you slice through plastic mesh or sheet and seal the edge at the same time. I have used on of these many times. I second that hot knife answer from Cameron. I’ll second the hot knife answer as well. I have seen it being used many times in nautical shops etc. for cutting polyester / ‘plastic’ rope: you can cut to length and melt the ends to keep them fron fraying at the same time. Pretty cool purchase therefore, especially since it seems to be a nice old, dependable model (check out that over the top heavy build: a modern one would be a flimsy glue gun-like thingy, right?). Many years ago, I had and used a hand tool with a tip just like that one to cut the inner traces on IBM 370 backplanes. I was told at the time there was a power tool to do the job but had never seen one. Last week I came across one that had been converted into a kids ray-gun and went off googleing for more info and came across this posting. Here is a link to what information I have collected so far. Including what I found here and elsewhere. This tool is missing th rubber hose that connected the pump to the tip. It is a soldering iron. I have used them in the navy, stationed aboard several ships and working in tool issue as an electrician. I was looking for info on a power drill my dad (who used to run a power tool repair business) gave me years ago and I couldn’t believe my eyes when I found this “Name This Tool” post. What I have is a Thor 1/4″ compact drill that has “Code: E 110″ (the model no., I guess) on the specifications plate on top. From the rear of the drill up to the front-most point of the trigger it looks exactly like the tool pictured here. The drill measures ~6-1/4″ from the rear to the end of the chuck and ~5-5/8” from the bottom of the grip to the top. I still use it although it needs a new set of brushes. I posted some photos of it at http://www.flickr.com/photos/donboroughs/ . Don, it seems we both had similar situations. My dad gave me one just like yours except the gray paint was worn badly. It is at least 20 years old and still works well. It’s a single speed, no reverse but plenty powerful. You might try an electric motor repair shop for brushes. I’ll bypass the sending photos part since except for the serial numbers the two are the same. I guess THOR made several devices based on the same base unit… It would be interesting to see if there are more out there. Came on line to look for brushes for my Thor drill Code E110. Let me know if you know a source. 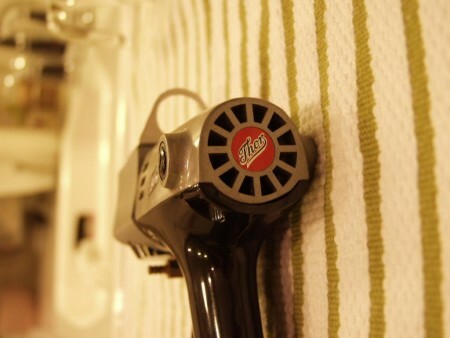 I tok over use of the drill in 1978 and have used it since. Small, powerful and reliable. The serial number is 9582-unreadable numbers. Thanks. I am an OLD IBMer and I used one of these for years to delete wiring patterns (nets) on circuit boards in mainframes as part of engineering changes to make circuit improvements. Of course I then had to rewire them in their new configuration using wire and wrap tools. Hey Phil.I was looking for info on a Thor wire wrapping tool.I doubt this one works but if you want it you can have it (free).Its a 115 v model. I am i in Uk.Dont know where you are but noticed these were made in USA Aurora.Ill. (it says so on it). Also its code is E101. I used to work at Thor Power Tool Company 1968- 1980, just before it went under as a division of the old Stewart Warner company which also went bankrupt. That there is one of them Ray-Guns. I seen some of them Martian fellers prowling around the woods out back of the shed a few months ago and they was a carrying em. The ones they had didn’t have no electrical plug end cord on em though, but I seen one of them there Martian fellers vaporize a raccoon with it. I have a Thor 1/4″ compact electric hand drill, code E100. I purchased mine at a swap meet for a reasonable price. It needed a new AC cord and new brushes. I used a grounded Computer AC cord and a grommet with a 1/4″ inside clearance for the center hole. I mounted the grommet at the base of the plastic handle. I purchased a 5mm X 5mm set of brushes from a seller in China thru e-bay. I used a flat mill fill on the replacement brushes until they fit in the brushes receptacle on the hand drill. My Thor hand drill now works flawlessly! I now own 3 of these 1960s Thor compact drills. One is a pre production E100 that does not have a label on it’s top and it uses only one diode, as does my second E100 model. My newest model is an E110 which was made in the late 1960s and has a full wave bridge rectifier. I have replaced the brushes, ac cord, cord strain relief, chuck key and chuck key holder on all three of my hand drills. All these replacement parts I found on E-bay. I used a cotton polishing wheel and brown polishing compound to bring the lusture to near new condition on all 3 of my hand drills.